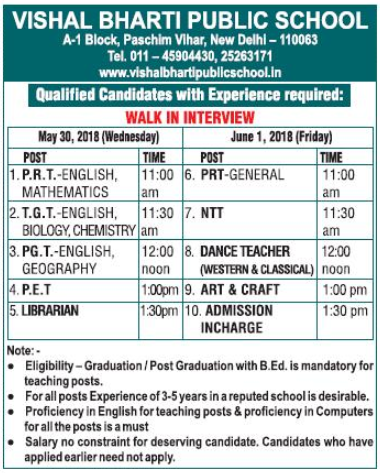 Vishal Bharti Public School, Delhi has advertised in The Hindustan Times Newspaper for the recruitment of PRT plus TGT plus PGT job vacancies. Interested and eligible job aspirants are requested to appear walk in on 30th May and 1st June 2018. Check out further more details below. About School: We believe in a balanced education that provides students with many and varied opportunities to develop new skills and experiences beyond what they may take away from the academic programme and to make significant contributions to the community beyond the campus. We nurture well rounded personalities who are confident, creative, self-reliant, knowledgeable and committed to humanistic values and democratic traditions with strong secular ethos.